October 2018 (the weekend before Halloween) 4 shows! July 10-27, 2014, A DREAM WITHIN A DREAM, Capital Fringe Festival, pre-recorded score for live theatrical performance. May 14, 2011 – METROPOLIS (1926) at the Smithsonian American Art Museum, Washington DC. Silent Orchestra presents, “ELEMENTS,” a musical and visual exploration of the Greek classical elements. Going against the grain of the melodramatic French studio film of the 1920s, the avant-garde extravaganzas of Marcel L’Herbier (1888-1979) are celebrated today for their inventive camera movements, astounding set designs, and freewheeling editing styles. L’Herbier’s sci-fi fantasy L’Inhumaine and his critically aclaimed L’Homme du Large are giants of French film history. L’Herbier even set up his own production company, an atelier for himself and other independents who worked outside commercial production. This series includes restored prints of four L’Herbier films. The Cinematheque Française, Gaumont, and CNC in Paris generously loaned prints. Special thanks to the Embassy of France. The music was compiled from our own compositions, improvisations, classic standards, and contemporary film scores. We will be joined by vocalist and multi-instrumentalist extraordinaire Susan Lowell for the Sunday screening of L’Inhumaine. A very special show indeed. The “rugged outdoorsy type” that Paul Hogan describes in his latest Subaru commercial might well have been actress and filmmaker Nell Shipman. She hailed from the Great White North and descended on Hollywood like an avalanche. 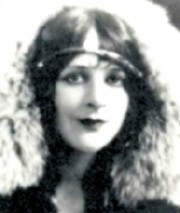 She is one of the most important figures in early cinema to come from Canada and a true pioneer of the action adventure genre. Her work predicts the animal hero genre that became a staple of TV. Shows such as Lassie and Rin Tin Tin owe a debt to Nell Shipman for opening the genre. Tom Trusky is a professor at Boise State University and is a leading expert on Nell shipman. He has compiled a of papers on Nell Shipman and will be introducing the films on April 13. Our score, which features marimba, piano, bass clarinet and vibes, incorporates minimalist and contemporary musical styles. 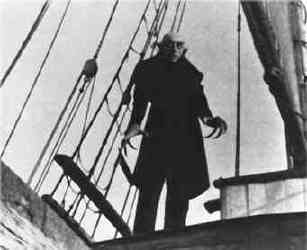 November 14, 2001 – Nosferatu, A Symphony of Horror! Silent Orchestra was one of the featured acts for the opening session called “Wired for Percussion.” Rich was in the spot light with his electric vibes, samplers and Kat MIDI controller. The silent film screening was a new experience for most of the percussionistas in the audience. This gig was for us a perfect opportunity to fulfill our mission of bringing classic films to a new audience”. Visions is Washington DC’s best Art House Cinema. Join us on Halloween at 10:00 PM for a memorable screening of this top selling silent film. Sponsored by the Washington Jewish Film Festival. On June 20, 1921, The New York Times reported, “The black magic of the Middle Ages, sorcery, astrology and all the superstitious realities of people so legendary in appearance and manners that the unnatural seems natural among them, have been brought to the screen … in The Golem.” The Golem legend is said to have influenced Mary Shelley’s Frankenstein. 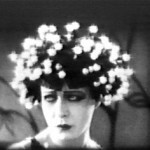 Both films feature very sylized art direction from Nazimova’s friend Natasha Rambova (before she became Mrs. Valentino). The films are part of the ongoing Art Nouveau series at the East Wing of the National Gallery of Art. There are more silent film shows in the series. Some are accompanied by pianist Ray Brubacher. Silent Orchestra opened the Thirteenth Virginia Film Festival with a bang. We performed our newly completed score with a brand new restored print. Following our show was the regional premier of Shadow of the Vampire, directed by E. Elias Merhige. It stars John Malkovich as F.W. Murnau and Willem Dafoe in a stunning performance as Max Schreck. Silent Orchestra made their first “unplugged” appearance for these two experimental films from Germaine Dulac at the National Museum of Women In The Arts. She has been described as a sensitive, independent and liberal minded film maker. She was also a militant women’s liberationist. The Smiling Madame Beudet (1922): In Dulac’s masterpiece the “smiling” madame is married to a dull and insensitive tradesman who irritates her so much that she dreams of killing him. Dulac’s style is defined by her impressionistic camera and advanced use of editing to transform her characters. The Seashell and the Clergyman (1928): A clergyman is tormented by sexual desires which challenge his vows of celibacy. Freudian imagery is used to express the frustrations. The film was originally rejected by the British Board of Film Censors for being “so cryptic as to have no apparent meaning. If there is a meaning, it is doubtless objectionable.” What more could you ask for in a film? 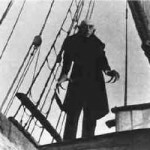 “I went to hear Silent Orchestra perform Nosferatu last Friday and was really impressed. [Their] grasp of long forms and ability to mirror the film maker’s mood exceeded my wildest expectations. [Silent Orchestra] have evolved into top notch composers for film. The place was packed and they were turning people away. A production of this quality deserves a far larger venue.” – Jennifer Cutting, Internationally Acclaimed Folk artist and World Music specialist.